Interface with more than 50 heads of schools of the three dioceses of Brahmapur, Cuttack-Bhubaneswar and Rayagada took place on 28th January, 2019 at the Bishop’s house in Btahmapur. Bishop Sarat Chandra Nayak presided over the day-long meeting which was animated by Fr. Joseph Manipadam from the CBCI Office of Education and the logistics of the day’s programme was coordinated by Fr. Bijay Chandra Nayak, the Regional Education Coordinator for Odisha. The revision of the All India catholic Education Policy, gearing up to face the present day challenges and a study of the impact of implementing the Catholic Education Policy were items on the agenda for the day. The Animation and Training programme at Jharsuguda on 30th January was attended by 53 heads of Institutions. It was conducted at the SVD provincialate and presided over by Bishop Niranjan Sualsingh of Sambalpur. Fr. Joseph Manipadam was the resource person while the programme was coordinated by Fr. Vijay Ekka and Basil Kullu, the Education coordinators of Rourkela and Sambalpur dioceses and participated by the heads of schools of the two dioceses. The revision of the All India catholic Education Policy, preparing to be proactive and gearing up to face the present day challenges and a look at the impact of implementing the Catholic Education Policy were the taskes cut out for the day. 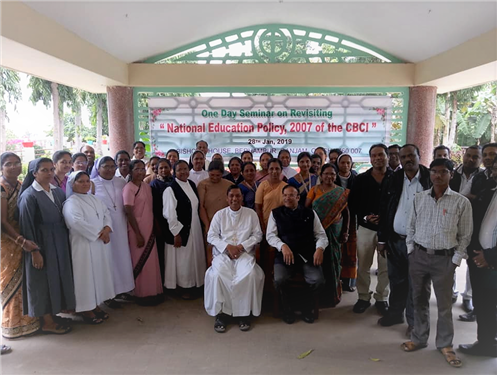 The meeting ended by 4.00 P.M.
52 heads of catholic Institutions participated at the day long programme at Balasore diocese organized by the Education coordinator of the diocese, Fr. Isaac Puthanangady. The meeting was presided over by Bishop Simon Kaipuram of Balasore diocese who participated at the meeting right through the day. The day long interactive sessions animated by Fr. Joseph Manipadam discussed the educational concerns of the Church and the effective implementation of the All India catholic Education Policy, in order to lead them to revisit the policy with a view to undertake the revision of the present policy. The meeting was concluded by 4.15 p.m. after discussing the various concerns that were also specific to Odisha.